Histidine is an α-amino acid that is common in many proteins and is essential in the human diet, at least in children. It is the precursor of histamine and important in the synthesis of purines. Like arginine and lysine, histidine is classified as a basic amino acid. 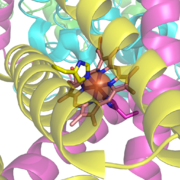 However, histidine's side chain allows it to act as both a base and an acid, both donating and accepting protons, which can be of considerable importance in its role as part of proteins. The L-isomer of histidine, which is the only form that is involved in protein synthesis, is one of the 20 standard amino acids common in animal proteins and required for normal functioning in humans. Histidine is variously classified as a "conditionally essential" or "essential" amino acid. An essential amino acid is one that cannot be synthesized by the human body from other compounds through chemical reactions, or at a rate sufficient to meet the body's physiological needs, and thus has to be obtained from the diet. Infants are unable to effectively synthesize histidine, making it nutritionally essential for infants. Historically, it has been considered non-essential in adults, who can go for periods of time without it in the diet, but today it is commonly considered essential for adults as well. The intricate coordination on the molecular level is seen in the role of histidine and other amino acids. The ability of a protein to function depends on the coordination of a number of amino acids, combined together and working in harmony. Some amino acids are instrumental for the folding of the protein, which has to assume a precise conformational shape to function. Histidine's unique side chain provides proteins containing histidine with unique properties as well. The protein then serves a particular role, such as enzymes catalyzing chemical reactions. If amino acids combine wrongly, this complex coordination will break down. Essential amino acids, such as histidine, show the importance of personal responsibility and discipline in the selection of diet in order to receive all the elements needed for good health. Histidine three letter code is His, its one letter code is H, and its systematic name is 2-Amino-3-(1H-imidazol-4-yl)- propanoic acid (IUPAC-IUB 1983). where R represents a side chain specific to each amino acid. The exception to this basic structure is proline, whose side chain cyclizes onto the backbone, forming a ring structure in which a secondary amino group replaces the primary amino group. The histidine bound heme group of succinate dehydrogenase, an electron carrier in the mitochondrial electron transfer chain. The large semi-transparent sphere indicates the location of the iron ion. Most amino acids occur in two possible optical isomers, called D and L. The L amino acids represent the vast majority of amino acids found in proteins. They are called proteinogenic amino acids. As the name "proteinogenic" (literally, protein building) suggests, these amino acid are encoded by the standard genetic code and participate in the process of protein synthesis. There are two enantiomers of histidine, D-histidine and L-histidine, but only the L-stereoisomer is involved in synthesis of mammalian proteins. Histidine's general chemical formula is C6H9N3O2(IUPAC-IUB 1983). Histidine has an imidazole side chain. Imidazole is a heterocyclic, aromatic organic compound. (Heterocyclic compounds are organic compounds that contain a ring structure containing atoms in addition to carbon, such as sulfur, oxygen or nitrogen, as part of the ring.) Imidazole refers to the parent compound C3H4N2, while imidazoles are a class of heterocycles with similar ring structure but varying substituents. This ring system is present in histidine, and the related hormone histamine. Imidazole can act as a base and as a weak acid. Imidazole exists in two tautomeric forms with the hydrogen atom moving between the two nitrogens. In even slightly acidic conditions, protonation of the nitrogen occurs, changing the properties of histidine and the polypeptide as a whole. It is used in many proteins as a regulatory mechanism, changing the conformation and behavior of the polypeptide in acidic regions such as the late endosome or lysosome, enforcing conformation change in enzymes. The imidazole side chains and the relatively neutral pKa of histidine (ca 6.0) mean that relatively small shifts in cellular pH will change its charge. For this reason, this amino acid side chain finds its way into considerable use as a coordinating ligand in metalloproteins, and also as a catalytic site in certain enzymes, such as aiding the catalytic functions of chymotrypsin (digestive enzyme) and those enzymes involved with metabolism of proteins and carbohydrates. Essentially, the imidazole side chain has two nitrogens with different properties: One is bound to hydrogen and donates its lone pair to the aromatic ring and as such is slighty acidic, whereas the other one donates only one electron pair to the ring so it has a free lone pair and is basic. That is, because of its unique side chain, histidine can act as both an acid and a base, both donating and accepting protons. These properties are exploited in different ways in proteins. In catalytic triads (three amino acid components found inside the active site of certain protease enzymes: serine, aspartate, and histidine), the basic nitrogen of histidine is used to abstract a proton from serine, threonine, or cysteine to activate it as a nucleophile. In a histidine proton shuttle, histidine is used to quickly shuttle protons; it can do this by abstracting a proton with its basic nitrogen to make a positively-charged intermediate and then use another molecule, a buffer, to extract the proton from its acidic nitrogen. In carbonic anhydrases, a histidine proton shuttle is utilized to rapidly shuttle protons away from a zinc-bound water molecule to quickly regenerate the active form of the enzyme. Histidine is a precursor for histamine and carnosine biosynthesis. The enzyme histidine ammonia-lyase converts histidine into ammonia and urocanic acid. A deficiency in this enzyme is present in the rare metabolic disorder histidinemia. Histidine is found in fruits such as bananas and grapes, meat and poultry, and milk and milk products. It is also found in root vegetables and all green vegetables, though in lesser quantities. International Union of Pure and Applied Chemistry and International Union of Biochemistry and Molecular Biology (IUPAC-IUB) Joint Commission on Biochemical Nomenclature. Nomenclature and symbolism for amino acids and peptides: Recommendations on organic & biochemical nomenclature, symbols & terminology IUPAC-IUB, 1983. Retrieved September 24, 2007.